The National Park Service is preparing for the worst. In November, the federal agency released its plan for how to operate Lake Mead marinas and launch ramps if the elevation of the Colorado River reservoir — the poster-child for prolonged drought in the Southwest — continues to decline because of overuse and climate change. To the passerby visiting Lake Mead, it has been clear for some time that things on the Colorado River are not working the way they were intended to. Signs warn of closures to boat launches. Underwater ghost towns are now visible because of low lake levels. From the top of the Hoover Dam, visitors see a bathtub ring, a chalk-colored display of how far the waterline has dropped. To the water manager, it has been clear for decades that things might not be working right. The Colorado River equation went awry a long time ago. The reason is simple. In many years, cities and farms are diverting water beyond the amount of runoff that flows into the Colorado River from snowpack in the Rockies. This structural issue has existed for several decades. But the nearly two-decade drought beginning in 2000 brought the structural issue into stark relief. Some water users, like Nevada, figured out ways to use less water years ago (more on that below). But other water users, like Arizona, have struggled to find ways to use less water amid competing interests from agriculture, cities and developers and a water rights system that does not do it any favors. As a result, Arizona remains the biggest holdout in signing off on a drought plan that the seven states in the Colorado River basin have been working on for years. If the states cannot agree to plans by Thursday, federal water managers from the Bureau of Reclamation will take action, starting a process to give the federal government more control of the river, challenging the ability for irrigators, cities, and states to manage the river collectively. 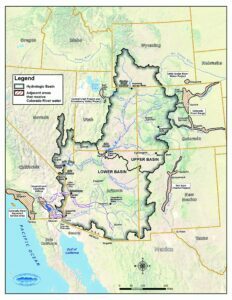 Historically, the federal government has allowed the states to make many decisions about how the federal government’s complex system of dams and reservoirs on the Colorado River should be managed. Negotiators from the states have created collaborative plans for federal water managers to follow. If the federal government took a unilateral action, it would turn that approach on its head. The bureau has not said what it would do next. But local water managers, including in Nevada, worry it could reduce their ability to advocate for their specific interests. The year is 1922 and negotiators from the seven states have just signed the Colorado River Compact. Among other things, they divided the massive Colorado River Basin at a crossing known as Lees Ferry in Northern Arizona. Flows below Lees Ferry went to the Lower Basin states of Arizona, California and Nevada. Above Lees Ferry are the Upper Basin states of Colorado, New Mexico, Utah and Wyoming — where the majority of the precipitation fell. What the negotiators did next was effectively split the river system in half. They said the Lower Basin and Upper Basin were each entitled to divert 7.5 million acre-feet of water per year. In a later treaty, the United States promised to deliver to Mexico another 1.5 million acre-feet (an acre-foot is the amount of water that can fill one acre to a depth of one foot). They also threw in an extra 1.0 million acre-feet for flows from Arizona’s tributaries like the Gila River. By 1944, water users had the right to divert 17.5 million acre-feet of water — on paper. That amount of water didn’t actually exist in most years. What does that mean for Nevada? Of the Lower Basin states, Nevada receives the smallest allocation of Colorado River water. But the river is crucial to Southern Nevada’s existence. Where Arizona and California divert surface water from other rivers, Las Vegas is almost entirely dependent on the Colorado River. The city pulls 90 percent of its drinking water from Lake Mead. At the same time, Las Vegas has taken proactive measures to secure its Colorado River water supply like no other state. Water managers in Las Vegas have implemented conservation measures and recycling programs. They have also stored water underground and are building expensive infrastructure to ensure that Las Vegas will be the only state able to take water out of Lake Mead at extreme conditions. Those measures mean Nevada will be able to easily recover from cuts in the drought plan. In an interview with The Nevada Independent last year, Entsminger likened the state’s position to that of Switzerland in global diplomacy, a party that can help broker deals when other states are not seeing eye to eye. He echoed this sentiment last week, as the Las Vegas Review-Journal reported, saying that the state was working with Arizona to help it reach a deal to sign onto the drought plan by Jan. 31. What’s the matter with Arizona? As the graphic shows, the burden of the cuts falls on Arizona. And accordingly, Arizona officials, torn between the interests of cities, agriculture, developers and tribes, have faced a challenging battle figuring out how to withstand the cuts. Arizona has known this reckoning would come for some time. The state’s rights are junior to California’s rights on the river. Under Western water law, that means California could take its entire allocation of Colorado River water before Arizona ever saw a drop in its canal. That is unlikely to ever happen. But state officials have long known that they would have to cut down or augment their tenuous canal supply by the turn of the century. When the canal was approved by Congress in 1968, some even suggested studying the quixotic plan of augmenting the Colorado River by diverting water from the Columbia River, which rises in British Columbia and snakes through Washington and Oregon. In 2019, with the deadline looming and a Lake Mead shortage predicted for 2020, there is little time left to wait. And for months, Arizona has been working on a plan to mitigate the impacts of losing nearly half of its Central Arizona supply as part of the Drought Contingency Plan. The plan appears to be nearing the finish line. On Jan. 24, the board of the Central Arizona Project, which transports about 1.5 million acre-feet of water in a 336-mile canal from Lake Havasu to Tucson, approved a legislative package that will now go before state lawmakers. But things could get tricky in the Legislature. There are concerns that other water issues in one of the nation’s driest states could subvert a delicate deal on the Colorado River. The burden of the cuts — at least at first — would mostly fall on Pinal County farmers outside of Phoenix. The farmers, with low-priority rights but significant political clout in the Legislature, have asked for replacement water to offset the cuts and funds to transition back to groundwater. The Gila River Indian Community, with high-priority Colorado River rights, had planned to sell a large portion of water to offset the impacts of the drought plan. But on Jan. 19, the tribe sent a letter, reviewed by The Nevada Independent, to Arizona water officials that threatened to walk away from the deal over legislation it said would undermine its rights on the Gila River. “We must inform you that unless this bill is either withdrawn or we receive some other reliable indication that it will not be moving forward, the community will unfortunately not be in a position to sign on to any of the agreements necessary for the successful implementation [of the drought plan],” the letter said. The legislation was introduced by Arizona House Speaker Rusty Bowers, a key player in the drought plan who told the Arizona Daily Star last week he has no intention of backing away. That has left observers concerned Arizona might miss the deadline or that the plan could fall apart. If no plan is approved by Jan. 31, the Bureau of Reclamation will issue a notice in the federal register asking the seven Colorado River states to submit comments about how they think management on the river should proceed during drought and a likely Lake Mead shortage. The states will have about a month to submit those comments.